Bas-relief lunette (1930) at the St. Francis Chapel at Merrywood, Marlborough, NH by sculptor Frederick Warren Allen. “Set into the arched niche above the heavy, blue door is a lunette plaque that tells the story of St. Francis and the Wolf of Gubbio. Quite frequently there is a swallow’s nest near the carved birds and other creatures watching.” (Stone Pond) The entry door to the St. Francis Chapel in Marlborough, New Hampshire takes you into a tiny sanctuary, still active for summer Episcopal services. Guests at the frequent weddings here approach the chapel under a bell attached to a stone arch onto a low-walled stone terrace overlooking Stone Pond. It has been under a canopy of trees in a grove of laurel with a mountain reflected in the mirror of the water just beside it since it was built by Francis and Justine Kershaw in 1926. The whitewashed stucco walls are punctuated with a bright Lapis blue wooden door and blue woodwork that frames the windows. 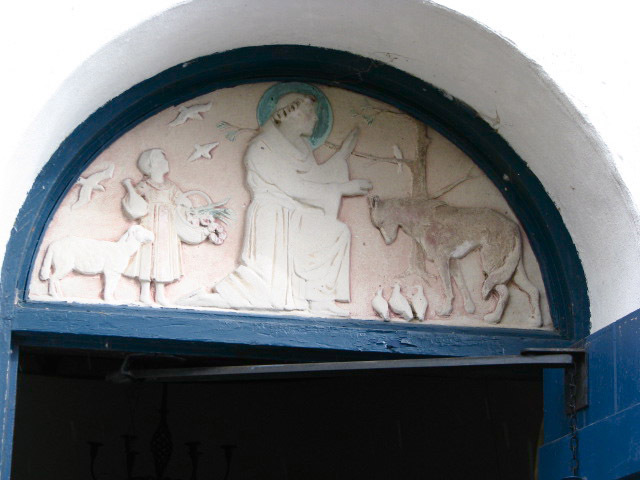 Above the entry in a lunette (a half-moon shaped space) is a bas-relief of St. Francis kneeling to bless a wolf. A child in a dress follows him accompanied by a lamb, bringing food and flowers in a basket. Birds fly and perch nearby; a peaceful scene in a serene place. In Stone Pond, A Personal History, William D. Eddy remembers that this gift of Frederick W. Allen, in memory of Francis Kershaw who had died the summer of 1930, had rich “Della Robbia-like” colors. The colors of the bas-relief have faded with time and the wood and paint of the frame often need repair, but the scene over the door still tells a meaningful story. Stone Pond describes the setting by saying, “If there was ever a place for feeling Franciscan about brother sun, sister moon and fruit, herb and flower, I have never encountered one comparable to this …” So St. Francis and his animals greet you as you enter this chapel door over which he kneels to welcome you. A lunette, or “little moon” is spatially similar to a triangular pediment in that it is high in the middle and shorter as it tapers toward the ends, both shapes that require careful composition to accommodate the size difference in the visual elements chosen. The largest or tallest figure is placed in the middle and dominates the work. Smaller figures are fit into the narrow spaces on either side either by using a full sized figure in a compressed pose or a smaller choice of subjects. Here St. Francis dominates at the center, the almost geometric lines of his body forming a solid mass against which the small details play to the right and left of him. The stillness of his presence contrasts with the busyness of the smaller forms around him. He kneels to reduce his size in relationship to the heights of the animals and the child, which fit nicely into the narrower ends. St. Francis fills the space from top to bottom and one quarter of the total width making it clear that this is the Chapel bearing his name. Each of the three portions of the design are uncrowded, with spaces between that become part of the design. Each third has sufficient detail and space to exist independently, while balancing the wholeness of the design. Symbolically Allen tells the old story of good and evil, darkness and light. St. Francis faces the darkness of the woods and the threat of the murderous wolf on one side. On the other side, birds fly in the bright sky and an innocent child and lamb come in the sunlight bearing gifts. The tale of the Wolf of Gubbio is that he was eating the livestock and killing the inhabitants of the town of Gubbio in Italy. He was lame and challenged finding food. There was such paralyzing fear that the townspeople stayed inside its doors when the wolf came near. St. Francis was sent on the dangerous mission of confronting and making peace with the wolf. They “talked” and made a pact that if the townspeople would feed the wolf, he would stay with them in peace. The wolf lived in Gubbio until his death two years later. It was considered a miracle. This little lunette is one of several works by Allen using the art of polychromy to color or tint plaster, stone or metal to achieve a more lifelike effect. Note here that the wolf’s fur, the branches of the tree and the hair of the saint are all brown, the background is a pale rosy color rather than white, the child’s dress appears to be pink with beige in the folds, the flowers in the basket are colored rose, the leaves on the tree and in the basket are green. The halo around St. Francis’ head is a bright blue and there is a bit of a peachy pink color in the hollow of his cheek. It looks as if his robe would have been a pale beige with darker beige in the folds. The color is gone except for what remains in the folds. Unlike a painting, which cannot be outside in the elements, this is ”like painting” in that it adds realism, interest and appropriate subject matter through the use of color to tell the story of St. Francis and to enhance the entrance to the chapel named after him. The relief has been cast in sand plaster or made of stucco as the surface has the feel of sandpaper. Stucco was made from plaster, sand and lime and would be an appropriate material for this exterior application.